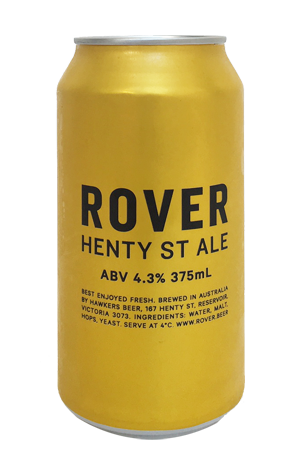 The Rover line introduced by Hawkers at the very start of 2017 has been reimagined at the very end of 2017. Out go the old school stubbies and in come tinnies off the brewery's newly installed line. There's a new beer inside the bright yellow tinnies too, one that takes its name from the street the Reservoir brewery calls him. It's of a similarly sessionable ABV to its predecessors but possesses a bigger character. Pouring a slightly deeper shade of copper than the tinnies, it fires off sharp, limey tropical fruit aromas and balances the hop load with a touch of caramel sweetness before serving up a faintly resinous bitterness. You'd probably put it in session IPA or XPA territory. Then reach for a second one. Available by the 6 pack or single can in store.